In pregnancy, a good posture is of utmost importance, whether you are standing, sitting or just simply lying down. Here, in this article, we will be discussing the perfect sitting position in which you should ideally train your body throughout the first, second and third trimesters. The enlarging belly may often give you the feeling that you are about to lose control and to go to topple over just any given minute. But as we all know, it is usually just how your changing body makes you feel. Follow a few tips of body mechanics, and you will have a smooth sailing pregnancy. A healthy pregnancy is not only contributed by a healthy diet and enough rest. Taking care of your body and its various postures during different activities also play a crucial role to protect you from possible injuries. Pregnancy brings about various changes in your body as you progress through the trimesters. Pregnant women undergo several hormonal changes which affect the body’s muscles and ligaments and then there is gradual weight gain. It, therefore, becomes extremely necessary that you adopt certain steps to adapt well to these changes. Taking the correct sitting positions during pregnancy will ensure that you don’t succumb to any injuries caused by bad sitting postures or suffer from body pain. If you are seating in a chair take care to see that you are sitting with your back straight. The knees should be bent at a right angle with your pelvis tilting forward slightly. While sitting though, ensure that your hip bones lean on the back of the chair. If you are seated on a chair that pivots and rolls, refrain from twist around the waist. If you have to move, it is best to turn your body entirely. It is always a good idea to use a back support to place the curve of your back in a comfortable position. Ensure that your body weight is evenly distributed between your hips, with the feet placed flat on the ground. For that, you can use a small pillow, a lumbar roll or a soft towel roll. Sitting on a work desk, you can adjust the height of the chair in a way that you are closer to the workstation. This will ensure that you don’t have to lean forwards towards your workstation while you work. Sitting like this your shoulders will be relaxed, and you can adjust your arms and elbows in a comfortable position. Whether you are in your first, second or third trimester, it is never advisable to sit cross-legged or cross-ankled. That’s because it blocks blood circulation and it can cause the varicose veins to swell. It is always advisable to sit with some cushions when couching on a sofa. One or more pillows would be great to support the curve of your back and your neck. In pregnancy, it is not an excellent thing to let your legs hang in the air when seated. It’s always best to place them flat on the floor. During pregnancy, it is never very comfortable to sit in one place for longer. Maybe, it is just another way of the body to tell you to change or adjust your position which is necessary. Shifting your position frequently allows for a better blood flow which is crucial during pregnancy. You can try standing up every 30 minutes or an hour and follow up with a quick stretching. This will relax your muscles and boost the blood circulation. While with a massive, ballooning belly you may feel like slouching now and then, be warned of its dangers. If you are slouching, be it on a bed or a recliner, it will encourage the baby in your womb to lie in a posterior position, a position where the baby’s and mother’s spines are closest to each other. This is something to be more cautious of during your last semester of pregnancy. A posteriorly positioned baby can make labor more challenging, something no mothers look forward to. The anterior position is thought to be the optimal position which makes the baby’s transition out of the womb much easier with fewer risks of back labor. If you are sitting on the floor, it is advisable to sit in the cobbler’s pose. For this, you simply have to sit up straight with knees bent, and bottoms of the feet brought together. Your sit bones should be placed comfortably on the blanket or mat. In fact, this sitting posture on the floor is one of the best ways of getting your hip bones ready for labor. This is an excellent sitting position for the second and third trimester. Seated in the car ensure you are wearing both the shoulder and lap belts, adjusting as snug as possible. The lap belt should be going through under your belly closer to the hips and across your upper thighs. Do not let the belt pass above the belly. The shoulder belt, on the other hand, is ideally placed between the breasts. If you are driving during pregnancy, you have to make sure you are sitting in the correct posture in the driver’s seat too. Using a back support at the curve of your back is most recommended when driving. Plus, make sure your knees are the same level as your hips or higher. Also, pull your seat close to the steering wheel so that you do not have to drive bending forward. Keep the seat close enough so your knees can bend comfortably and the feet can easily reach the pedals. Depending on your height, your belly should be around 10 inches away from the steering wheel. The steering wheel needs to be tilted towards your chest and far from your head and belly. However, when you are in the last trimester of your pregnancy, you should best avoid driving as your belly is going through its largest size phase. Practicing sitting on a stability ball is not only an excellent way to exercise during pregnancy but also, making your body more ready to overcome the challenges of labor smoothly. The balance ball is a must have comfort stuff for gestation. Just make sure that you get a ball that’s ideal for your height. Sit on the balance ball to boost your core strength and stabilize your pelvic bones. While you can use the balancing ball for sitting throughout your pregnancy, it is more recommended to spend more time sitting on it during the last trimester. Sitting on a balance ball also helps the baby come in just the perfect position for a smooth labor. You can replace your regular chair for a balance ball when you have to sit at the desk. Balance balls are also called gym balls, medicine balls and for would-be mothers, the birthing ball. While these balls are mostly the same, the ones specially made for birthing differ by having a non-slip finish. This gives them a better grip on the floor reducing any risks of you slipping and falling while sitting on the ball. Most of these are also manufactured with PVC and are latex-free but just in case; you are allergic to latex, it is well worth watching out for the labels. Besides round birthing balls, the latest peanut shaped ball also make an excellent balance ball to have during your pregnancy months. This ball rolls only one way, unlike the regular ones who roll in every direction. Peanut shaped birthing balls are perfect for you if you feel insecure sitting on the round ones. Plus, the peanut shaped balls tend to be smaller in size and are great to train you for squatting positions needed for labor. Whether you are on your first, second or third trimester of pregnancy, it is always important that you keep your back straight when you sit. As you progress though from your initial first months, you will feel the need for back support, and that’s perfectly fine. Rather, a back support that holds the curve of your back is much recommended. Doctors usually advise against sitting cross-legged during pregnancy. 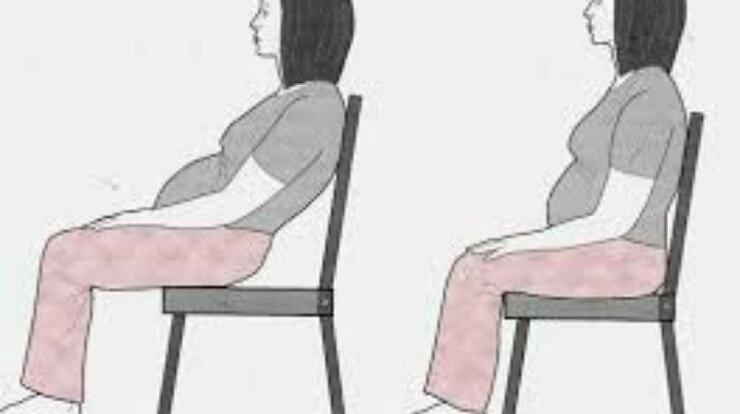 Furthermore, if you are already pregnant, you may have experienced that sitting in one position for a long time makes you feel uncomfortable. To combat that, simply avoid sitting in the same position for long. Shift your position if you have already been sitting like that for some 30 minutes. Finally, just as when you are about to stand up from your sitting position, first move to the front edge of the seat and then slowly and steadily stand up as you straighten your legs. When pregnant, do not bend forward when standing up.